Katie Jinks finds that a simple game of football kicks off some gender wars between her girls school and the local boys school, with the girls ending up trying to beat the boys at stereotypically ‘boys’ activities and the reverse. Luckily, they’re all amusingly hopeless at everything! It continues in the subsequent week’s issue too. The Blind Ballerina escapes from near-death and is rushed straight to the theatre for her debut as a prima ballerina! But a further turn of fate awaits her on stage – Barbie hesitates visibly in front of the audience, who don’t know that she is blind and therefore do not realise the joyous feeling she has as she can suddenly see again! Will it be only temporary, or will she get to see her little sister with her newly-regained sight? Despite some protective rowan berries, the evil Miss Marvell has managed to get a patsy to do the dirty work of pinching the corn dolly from Lucy’s bag at school – leaving the girls defenseless against her dark works, unless they manage to steal her back. In “Dora Dogsbody”, a mix-up of hairdressers sees Ma Siddons getting the latest hair-cut – for a poodle! Heh heh, she does look a fright. Debbie Lane has tasted success for the first time in “Valley of the Shining Mist” – thanks to the mysterious Mrs Maynard she has won a talent competition, but forgotten the challenge that she was set by the same lady. It turns out (after she has spent most of the prize money) that the challenge is to bring the whole lot – £100 – to the Valley to hand over! As her nasty cousin Elaine says, surely Debbie’s being taken for a ride! The saga of “The Green People” is nearing its end. Evil aunt Zella has sent the true rulers of the peaceful underground world to meet the giant monster Krakengerd, expecting them to be slain. That may yet happen, along with their friend, surface dweller Julie! If you’re a relatively recent reader of this blog you may not have seen a couple of linked posts I did back in June last year, explaining an analytical concept I came up with and named the WTFometer. The idea of this was to give a framework for looking at how bonkers (or not) a story’s plot was, by comparing the story to an assumed ‘average reader’s situation’. This gives a structured way of comparing stories, including the possibility of finding patterns of oddity in seemingly-different stories which are perhaps odd in similar ways. At that point I only posted 3 complete WTFometers – for “Song of the Fir Tree“, “The Children of Edenford“, and “Worlds Apart“. “Song of the Fir Tree” was surprisingly more extreme than I would have expected it to have come out as: with a boy and girl protagonist, serious threat of death, and a long journey across lands quite foreign to the assumed readership of Jinty, the story scored reasonably high on the WTFometer at 39 points. 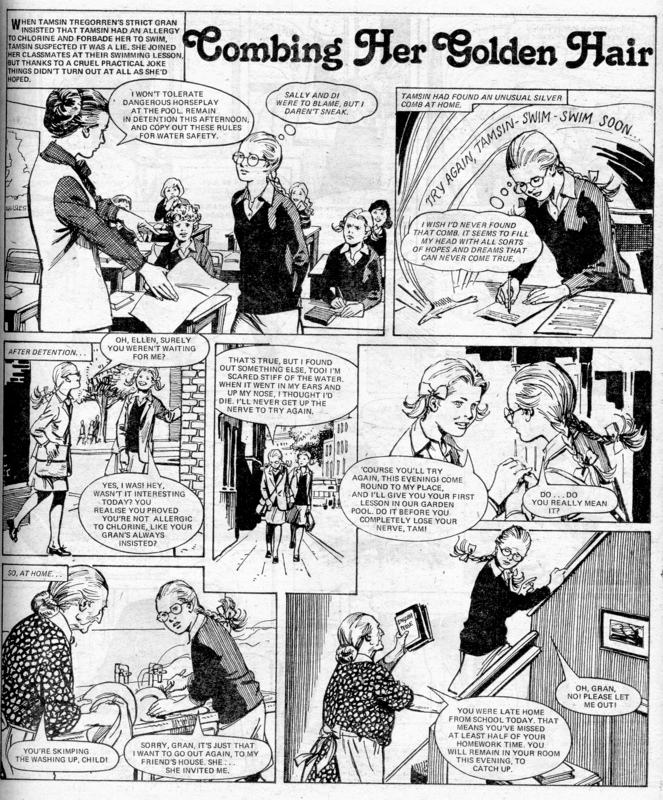 “The Children of Edenford”, likewise, had some surprises in store – the analysis highlighted the fact that a great deal of the setup was quite similar to that of the expected readership – it takes place in England, doesn’t move far from its initial geographical setup, and the protagonist herself is not very different from the typical reader. What marks it out and gives it an eventual score of 24 is the lack of agency of the characters – this is a story about free will – and the strange school setup, as well as the serious threat of death towards the end. There was little surprise in the very high score of 87 for “Worlds Apart”, a strong contender for the most bonkers girls comics story of all. The WTFometer may not surprise us in this case, but the story’s very extremeness can more easily quantified by this method that gives us a comparison across stories. There’s little sense in developing the concept and then not using it for more than a few stories, but of course there’s always plenty to write about on this blog between me and Mistyfan, and the WTFometer has lain unused since that time. However, a couple of months ago I created a few more WTFometers; I didn’t post them at the time as they turned out not to fit the main theme of the posts I was writing. I am now therefore including them in a post of their own, re-opening discussion about these stories but also about the WTFometer generally. Firstly, I wanted to compare two tear-jerking stories. They are not quite the same; the first story involves emotional cruelty, and the second is about grief and its effects. Both were very popular, both were written by female writers. The first one is “Little Miss Nothing”, and the second is “Stefa’s Heart of Stone“. 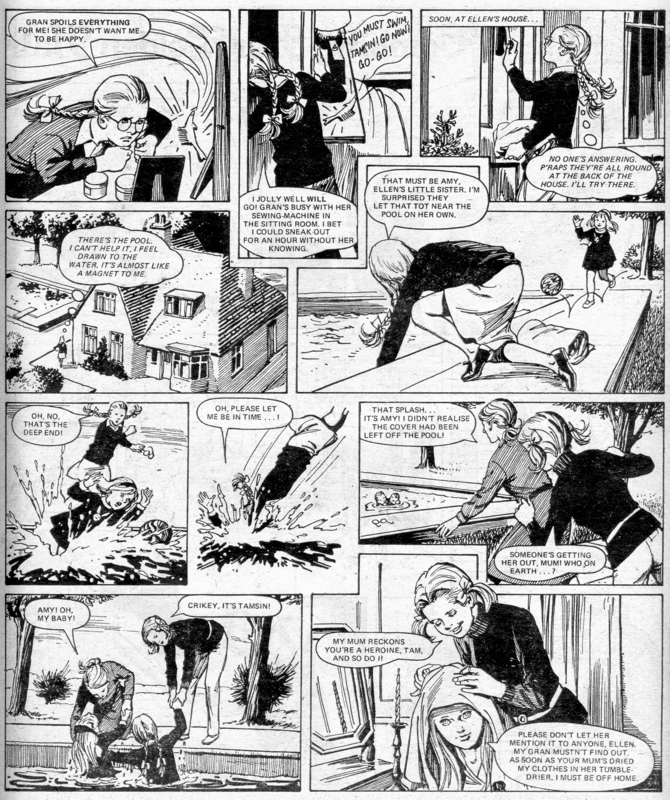 “Little Miss Nothing” is one of the originators of the cruelty/suffering theme that became so popular in girls’ comics of the 70s. 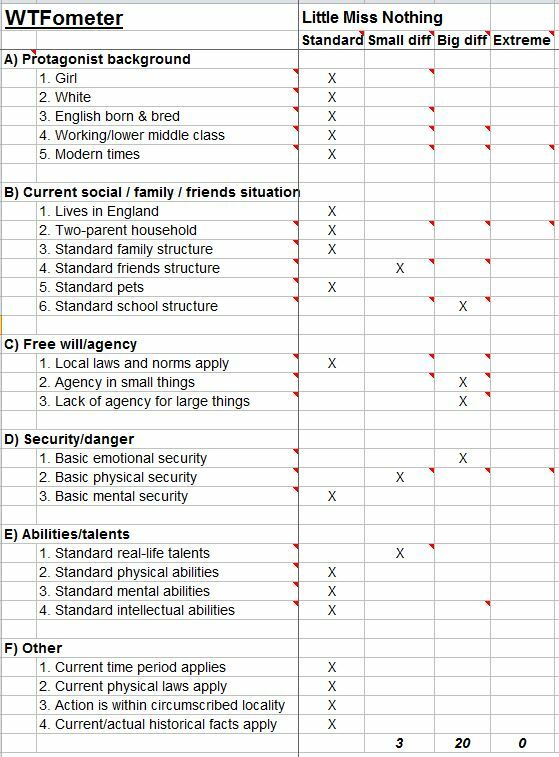 As such it is perhaps not surprising to see a relatively low score of WTFness overall at 23 points; the character is taken out of a normal school environment but much of the setting of the story remains close to an ordinary readers’ life: the key focus is on the removal of much of her agency as she is bossed around by others, and on the emotional abuse she suffers. “Stefa’s Heart of Stone” was published a few years later. Again, much of the setting of the story will be very familiar to the readers. 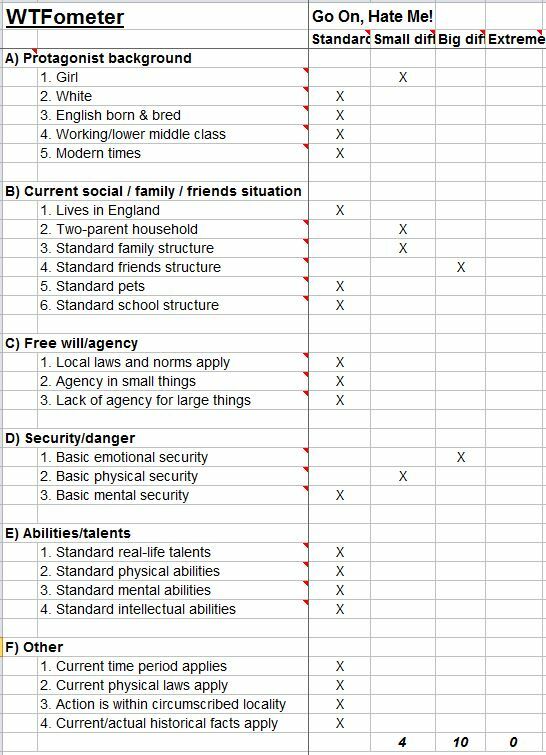 As it is a very focused story of grief and severe emotional withdrawal, only some of the categories score highly and overall the WTFometer score is not very high at 22. “Go On, Hate Me!” is here partly because it is another emotional cruelty / tear-jerker story, but one known to be written by a man. 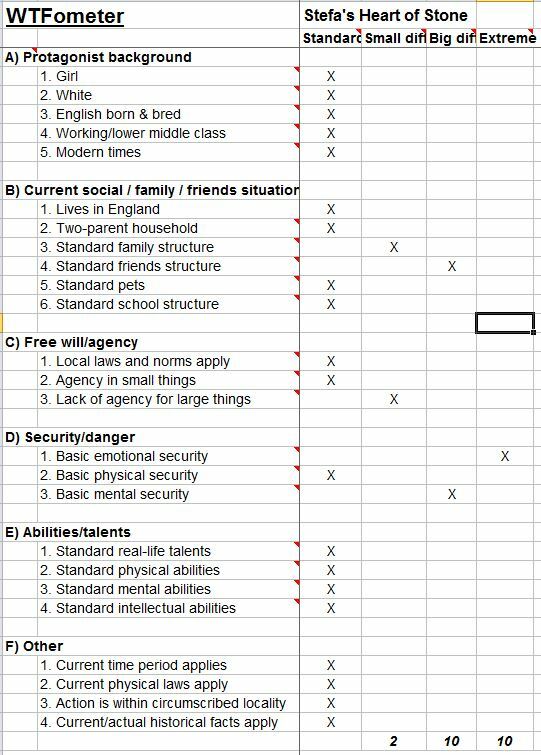 It would only be a small sample which wouldn’t prove anything, but could it indicate anything about possible differences in writing between the genders? 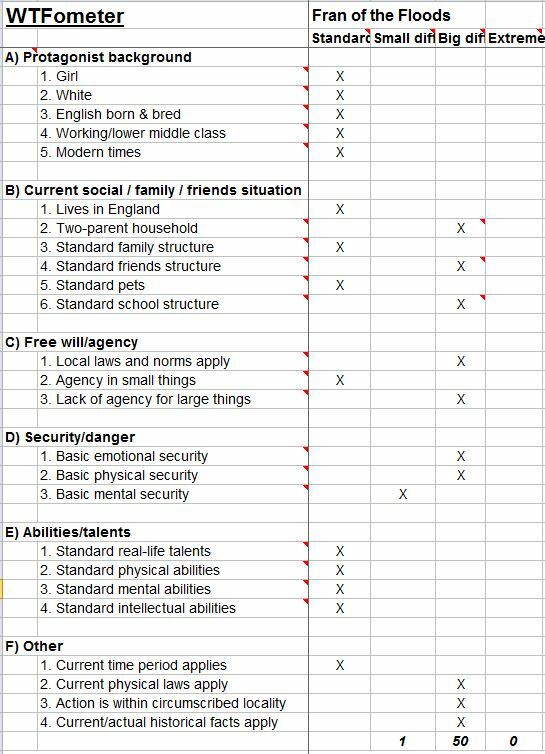 If anything the extremeness of the scenario explored in this story is lesser than in the two stories above – the protagonist is a young woman rather than a girl, not living in a two-parent household, not surrounded by a small group of close friends; but the one key element that stands out on the WTFometer analysis is the exploration of the emotional abuse. Remember that the WTFometer is not a tool for looking at neatness of dialogue or tightness of plot – it is purely one element of a general analysis, and says nothing about how well overall a story works or doesn’t. On this analysis, “Go On, Hate Me!” has just one striking angle of attack rather than being generally over-the-top. “Land of No Tears” is of course also known to be written by a man, but one who has categorised himself as being one of the young men ‘killing themselves laughing’ (Pat Mills, of course). Does this mean the story ends up looking particularly over-the-top in a way that Len Wenn’s story above does not? Yes, indeed – though of course this is a science fiction story anyway which by its nature will involve a lot of moving away from the expected context of the assumed Jinty reader. At 45 it is one of the highest scoring stories on the WTFometer so far, second only to “Worlds Apart”. 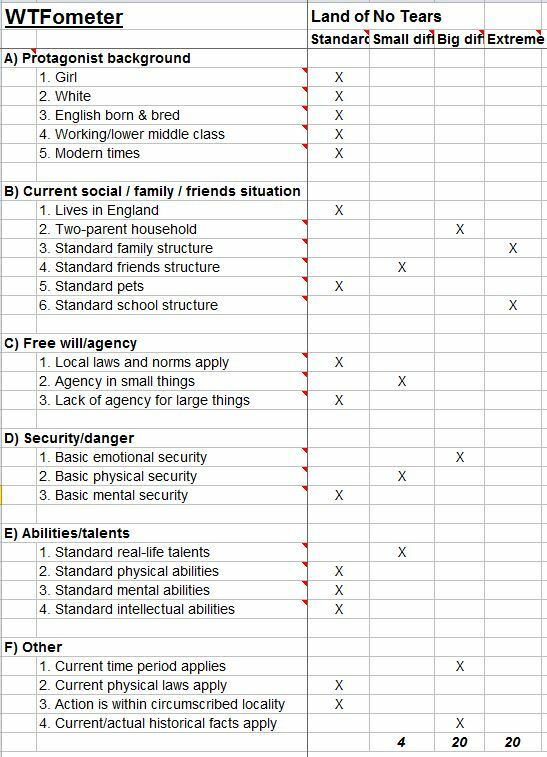 It is also noticeable for having a spread of differences compared to the ‘expected reader’ – it portrays a world different to that girl reader’s in many and varied ways, not just one or two. If we did a WTFometer for a non-science fiction Pat Mills story, “Concrete Surfer”, I’m sure the score would be much lower. “Fran of the Floods” is another science fiction story, this time known to be written by a woman. It actually beats LONT on its WTFometer score with a total of 51 – though the story protagonists share a lot of initial similarities with the readers, the journey they are taken through, and the world they end up in, is radically different from what the readers live through. Phil Townsend is not an artist whose life and career I know much about. It seems from Bear Alley that he was a contributor to the sixties title Boys’ World and probably also illustrated some children’s books (but the thorough Steve Holland had not at the time of writing that post found any more information). 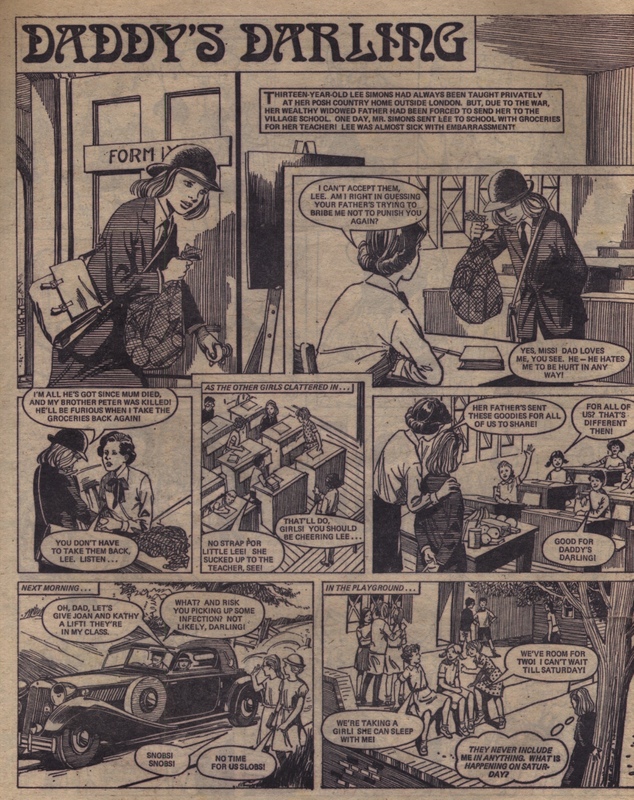 He was a regular Jinty artist from very early on: while not in the very first issue, his beautiful clean style appeared in the title within the first couple of months of publication. 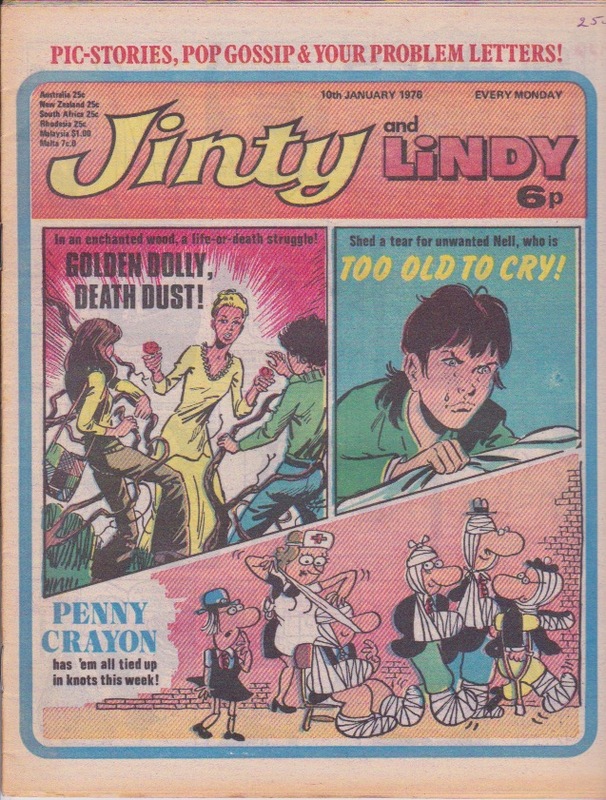 After Jinty, he became a regular in Tammy, but from then on my information runs out. I would be very grateful if anyone were able to supply more information, as even his Comiclopedia entry is exceedingly brief. 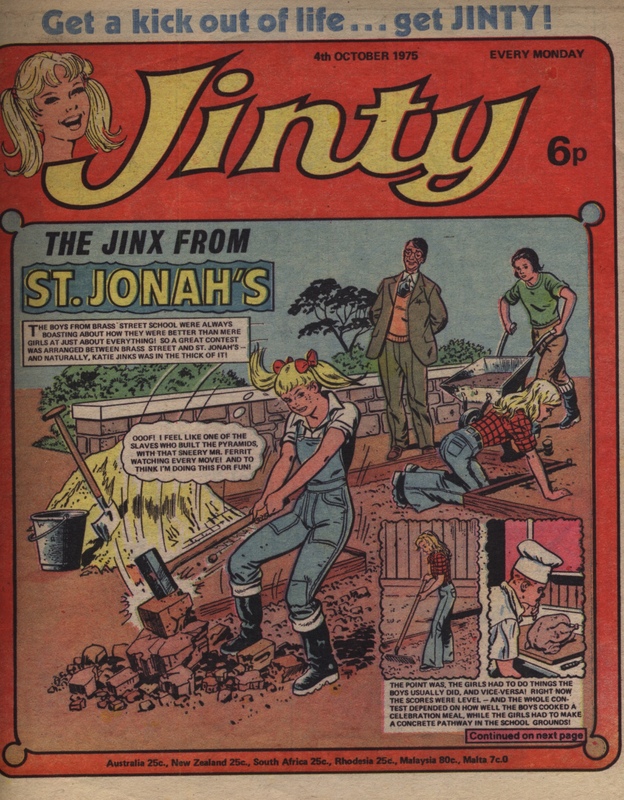 Rivalling Phil Gascoine for productivity with 20 stories drawn for the title, his impact on Jinty is amongst the strongest of any artist: many beautiful and striking covers were derived from his internal artwork, and he has a number of memorable stories to his credit too. 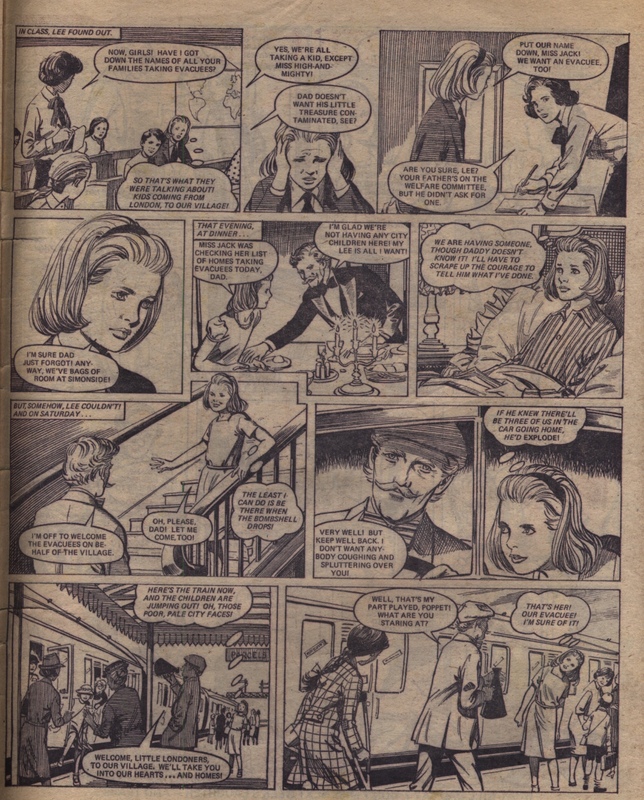 Many of the stories have a ‘type’; we’re informed by Mistyfan that in Tammy he regularly drew stories written by Alison Christie, and from what we now know it seems a similar circumstance applied in Jinty too. Many of the stories he drew were tear-jerkers: “Always Together…”, “Somewhere Over The Rainbow”, “Nothing to Sing About”, and of course in particular the well-loved classics “Song of the Fir Tree” and “Stefa’s Heart of Stone” had children dealing with grief, lost homes, lost parents. Others were more mystery-focused: “Then There Were 3…”, “Stage Fright!”, and “Waking Nightmare” were earth-bound mysteries resolved through non-supernatural means, while “Spirit of the Lake” had a real ghost (unlike “The Ghost Dancer”). For me his top story would clearly be the previously written about “Children of Edenford“, but the mermaid-child tale “Combing Her Golden Hair” comes close behind, and I have soft spots for both the slightly-spooky “Child of the Rain” (tennis player is mysteriously affected for good or ill by the rain forest she visits) and the strong near-thriller “Stage Fright!”. 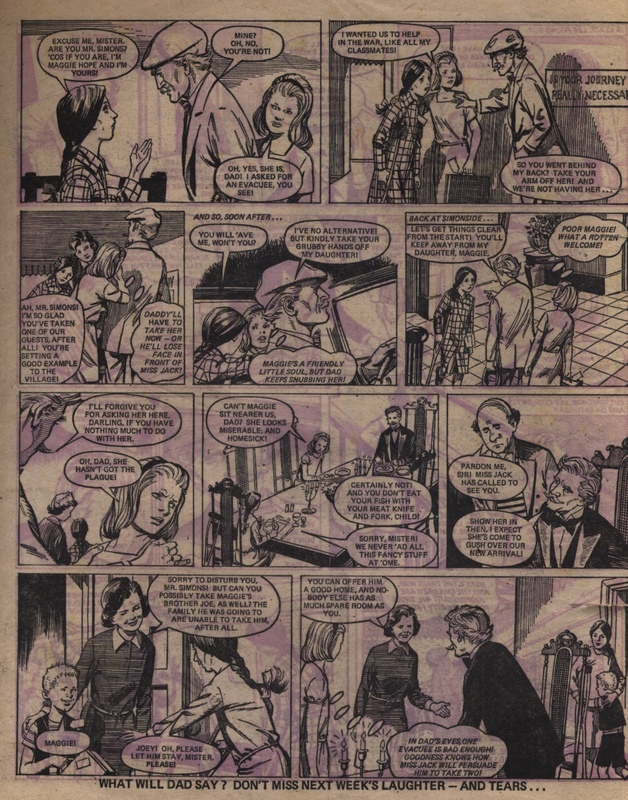 Likewise, Mistyfan has expressed her admiration for the persecution story “Mark of the Witch!” I think that most Jinty fans would be likely to count at least one Phil Townsend story amongst their favourites. Of course the writer drives the story forward as much or more, but the immediate and lasting impression of the comic is so strongly shaped by the art; it is hard not to look at a Phil Townsend-illustrated story and to love it, be the story stronger or weaker. 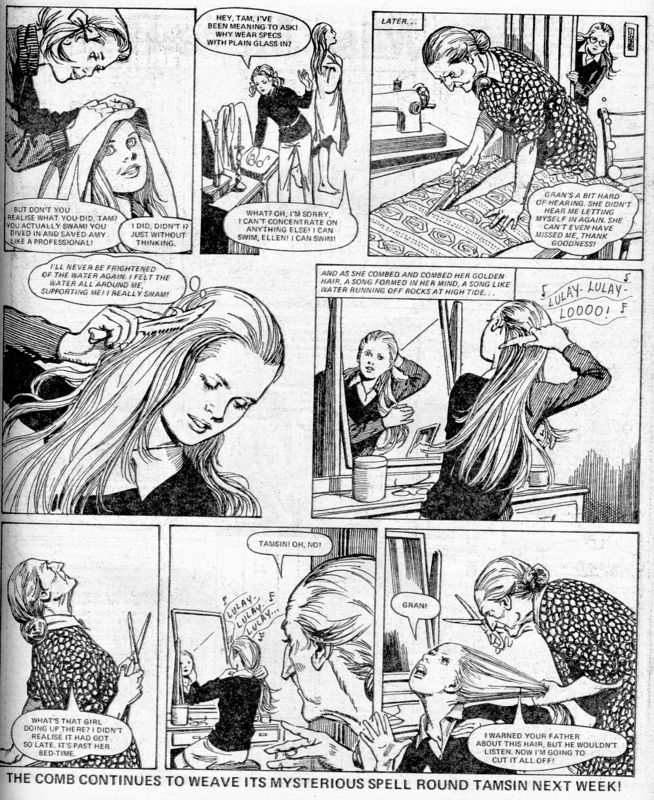 To illustrate this post, I have chosen some pages from “Combing Her Golden Hair”, taken from the issue dated 6 October 1979. Tamsin has found a mysterious silver comb, which is altering her life dramatically, but not in ways that her stern grandmother approves of! The last panel leaves us with a striking cliff-hanger, of course, though it turns out that the grandmother has better reasons for her actions than we know at this point.